Yisu undertook his first research project during his second summer at Tufts, focusing on the optimization of Haskell programs. He began by implementing an algorithm designed and prototyped by a graduate student, Diogenes Nunez. After evaluating the algorithm on a set of benchmarks, Yisu was able to enhance the performance of the algorithm. A paper based on this work was accepted to the 2016 Haskell Symposium, and eventually became part of Yisu’s undergraduate thesis. Yisu’s research continued the following summer, where he participated in a NSF Research Experience for Undergraduates (REU) program to work on the Harvard Privacy Tools. As part of the project, Yisu worked to build a system for social scientists to share research data while respecting the privacy of the participants. Building on the theory of differential privacy, he designed and implemented one of the components of the system. 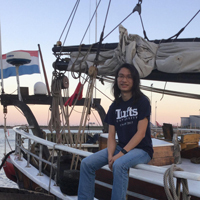 Later, through connections made during the REU program, Yisu had an opportunity to work with Professor Claudio Orlandi at Aarhus University in Denmark. Yisu says that one of the aspects of research that he most enjoys is challenge of solving new problems and studying fundamental laws in science. He says that “just like I enjoy running because it exercises my body, I enjoy research because it exercises my mind.” In addition to working on specific research problems, Yisu enjoys being part of the research community. He says that he felt “happier than ever when attending ICFP in Nara, Japan.” He also enjoys interacting with researchers in other areas. When he participated in the REU program, he was inspired by discussing ideas with other students working on entirely different problems. Yisu is currently pursuing his Ph.D. in Computer Science at the University of Washington, and is advised by Professor Alvin Cheung. Yisu feels that his undergraduate research experiences were helpful when applying to selective graduate programs. Moreover, these experiences have helped him confidently identify his area of interest as he begins his Ph.D.